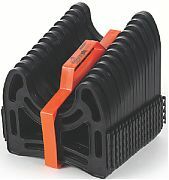 The Sidewinder is a sturdy, lightweight plastic sewer hose support that winds around obstacles and is angled for better drainage. It won't creep closed. The deep cradle keeps the hose from rolling off without straps.